Using Name2Homes unique algorithm to determine where lost revenue can be found, you can be sure that all information collected is accurate and based on an unmatched set of unchangeable criteria. Making Name2Homes the strongest and surest way to guarantee accurate missed revenue collection. Name2Homes is SSL secure which guarantees that all data collected is free from compromise and exists only for your use. Using Name2Homes unique web based application there is never a need to buy expensive equipment, conduct time consuming system upgrades or hire additional staff to manage new technologies. Name2Homes offers an effective and dynamic way to determine, locate and potentially collect lost revenue in a manner that is simple, fast and complimentary to ways collection may be currently done in your county. It also offers counties the ability to share and track nationwide. Building a securer national framework for revenue collection. 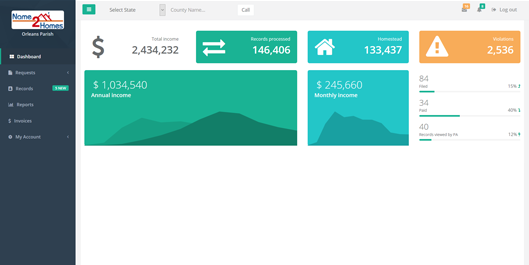 Admin dashboard to get revenue and stats at your fingertips. Well built CMS to manage, interact and take action on records. The Homestead Act allows homeowners to only declare ONE county as their homestead locale so for instance a citizen homeowner who has multiple homes can only declare one as his primary (and thus) Homestead residence. Many homeowners however declare homestead in 2 and sometimes more locations. They declare in the same state or in multiple states thus taking advantage of sometimes very generous tax breaks that are set aside for law abiding homeowners. Name2Homes seeks to help counties identify the violators of the homestead exemptions in the counties that use Name2Homes. This allows counties to identify, fine, and collect on homestead violators. This creates an equitable system for law abiding homeowners, generates revenue for counties who have long overlooked violators due to the slow and arduous process that exists to determine who the violators are. It also allows reciprocity between states where these violators may have other homes. The Name2Homes system is a boon to counties who are seeking revenue that is owed to them by these violators. Another plus to the data collection and retrieval process is that the statutes of limitation is in many instances a decade or more allowing counties to conduct searches going back many years. This creates layers by which counties can conduct the business of retrieval and collection.